Flying Virgin Atlantic? Brace yourself for cyborg-like attendants armed with detailed info on air passengers. 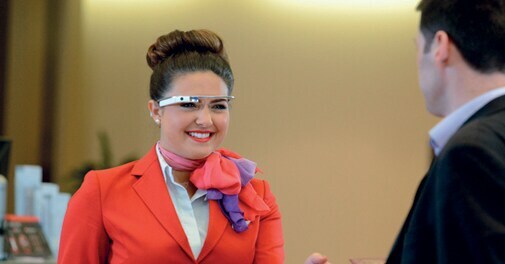 IF YOU ARE PLANNING TO FLY business or first class from London Heathrow airport on Virgin Atlantic, don't be alarmed to find yourself face-toface with airline employees wearing a wide grin and the latest technological marvel to hit the market - the Google Glass. 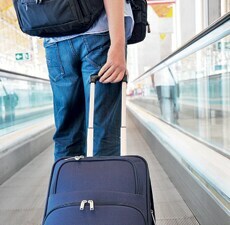 The wearable technology, along with the Sony Smartwatch 2, will be used to identify and greet passengers by name and provide the latest updates on their flight information, weather and local events at their destination. A development that has been touted as the first step towards 'smart' flying, it is being tested by Virgin as a six-week pilot project before considering a wider roll-out. The airline also foresees potential for the technology to deliver more personalised services, such as identifying travellers' food preferences and travel habits. Heading towards a flying revolution, are we? For those tired of waiting in serpentine queues at visa offices, here's some long-awaited good news. Emirates, which operates flights to 141 destinations across the world, has launched a new customer initiative that promises to make travel easier for globetrotters across the world. Through the programme, brought about in partnership with Visas of the World, Emirates' customers can apply for travel papers to as many as 10 international destinations at the click of a button. As an introductory offer, Emirates also announced the waiver of the visa service fee for the first 100 visa applicants. Airline customers can log on to www. emirates.com/in to apply for visas to UK, USA, Canada, Switzerland, France, Germany, Italy, Netherlands, The Google Glass concept is initially being tested by Virgin as a six-week project Nigeria and South Africa. RETURN OF THE SUPERSONIC JET? Take heart, all ye who bemoan the retirement of the Concorde. Bostonbased Spike Aerospace plans to develop a 12-18 seater supersonic private jet capable of flying from New York to London in just under four hours. The aircraft, named Spike S-512 and made at a cost of $80 million, would be capable of touching 1,935 kmph - twice the speed of conventional jets. But as many hurdles lie in its way, especially an American rule prohibiting supersonic vehicles, here's to speeding the paperwork along! There are luxury hotels of all shapes and sizes across the world, but Lonely Planet is of the firm belief that the most distinct among them is Mihir Garh, a fort built from scratch in the middle of the Thar desert in Rajasthan. Named as 'the most extraordinary hotel in the world' by the travel guide book publisher, Mihir Garh (Fort of the Sun) was a labour of love for owner Sidharth Singh - who engaged more than 100 local craftsmen and carpenters to create nine 1,700-sq feet suites over a period of two years. In the second place came Planet Baobab, a collection of grass and mud huts with an onsite "shebeen" (bar) in the Makgadikgadi salt pans of Botswana. Other extraordinary hotels include a collection of spherical treehouses suspended in a Vancouver Island forest, a 1869 lighthouse on the Hudson river, NY, and a cave hotel in Cappadocia, Turkey. If you enjoyed chugging all the way from UK to France through the Channel Tunnel (in pic), here's a piece of information that will make you go wild with excitement. China plans to construct the world's longest passage below sea level from Yantai in Shandong to Dalian in Liaoning, cutting the journey time between the two far-off provinces to as little as 40 minutes. Once the blueprint is approved by the administration, work on the 123-kilometre tunnel will start early next year - costing the Chinese exchequer $36 billion and giving tourists across the world another momentous attraction to look forward to. Whoever advocated the benefits of travelling light probably did not take Singapore Airline's latest offer into account. The air carrier and its regional subsidiary Silkair have announced a 10kg increase in check-in baggage allowance across all sections - suite, first class, business class and economy. Going by this, an economy class passenger will be allowed to take 30kg while those travelling by business class and first class will be permitted as much as 40kg and 50kg respectively. However, if you are an elite gold member of the airline's frequent flier programme - KrisFlyer - or a gold status member of the Star Alliance programme, you will get an additional 20kg absolutely free. Nothing (or, very little) gets left behind! This is one app that will come in handy at home and abroad. A useful app for finding out what is around you and where you want to go next, Around Me determines your location and shows you facilities in the neighbourhood in accordance with various categories (such as ATMs, coffee shops and hotels). This is one app that will come in handy at home and abroad. The app is free.